We’ve all been there. Do you include the punctuation inside the quotes or outside? Where does the question mark go? Do I really need to use a dialogue tag? So many suggestions and rules from very talented people. Some I’ve followed, but some I’ve ignored. The following are my rules and they work in every situation. First, avoid using dialogue tags as much as possible because it’s true that you don’t need them. Second, I restrict myself to only three dialogue tags: said, asked, and the occasional exclaimed. Third, always structure the sentence so that the dialogue tag is on the inside, between the quote and the speaker regardless of which comes first. With those restrictions, only nine combinations are possible. 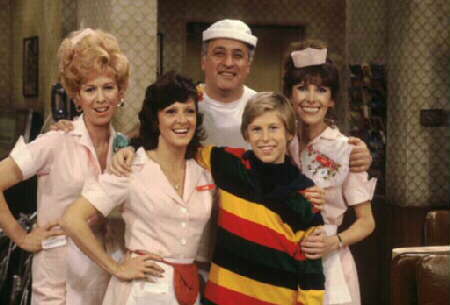 With help from the cast of the 1976 television series Alice, let’s explore them. Use the dialogue tag ‘asked’ with a comma before the quote. Use a question mark before the closing quote. “Alice, did you charge that guy for soup,” asked Mel in a gravely voice. Use a comma before the closing quote then ‘asked’ as the dialogue tag. End with a period. “Kiss my grits,” exclaimed Flo. Use a question mark before the closing quote. “Doesn’t he like Phoenix,” asked Vera. Use the dialogue tag ‘said’ with a comma before the quote. End with a period inside the quote. “I want Tommy to have a future,” said Alice. Use a comma before the closing quote and ‘said’ as the dialogue tag. End with a period. Use a period inside the closing quote. Use the dialogue tag ‘said’ with a comma before the quote. Use an exclamation point before the closing quote. Use a comma before the closing quote and ‘exclaimed’ as the dialogue tag. End with a period. “Well, Sugar, I’d let you have the sandwich for free but…” said Flo gesturing behind her toward Mel. Use an exclamation point inside the closing quote. I think journeys are common in stories because they echo our own travels through life. As we navigate life, we make decisions and choose between alternatives. Sometimes we know the consequences of a choice, sometimes we don’t, and sometimes we know where a choice will lead but don’t care. Notice how even the language used to illustrate this point is loaded with journey imagery? Travels. Navigate. Lead. It is difficult even to find neutral words. To illustrate: What is the core difference between the atheist and the believer? Between the naturalist that thinks life’s origin is explained by evolution or the Christian that trusts in the existence of a Creator? One has chosen to believe in the existence of God and the other has chosen not to. What a difference that single choice makes in the life of a person! Life is a journey, choice is powerful, and the future beckons to us all. Hide clues in plain sight. Duh. Most people are not that observant and rarely see what is right in front of their face. If you include information in the form of a list, always bury the most important part in the middle. People notice the last thing in a list best, the first next-best, and the middle last. Share clues out of order. If you know that John has access to Love Potion #9 (A), Love Potion #9 actually causes explosions (B), and an explosion destroyed the rebel headquarters (C), then it’s reasonable to conclude that John is responsible for blowing up the HQ (A -> B -> C). Many crimes in detective novels are constructed by the writer this way whereas the hero often learns A, B, and C in REVERSE order. The crime (C) comes first, then the method (B), with the connection to the culprit (A) arriving only at the end. The drawback of this method is that it excludes any kind of surprise ending. Avoid this by changing the order: Share (C) and (A) with your reader while withholding the crucial (B) that links the two to stretch out the suspense or setup a twist. For longer chains of clues (A -> B -> C -> D -> E) you can get very, very creative. Just don’t get so complicated that readers can’t follow the chain. Establish a secondary purpose for something already included. In the book Ender’s Game by Orson Scott Card, the mind game program that Ender periodically interacts with is used to explain how the buggers communicate with Ender at the end of the book. However in the sequel, it must ALSO be the source for a sentient computer program. We humans like our loose ends packaged up into nice, neat little containers. Card surprises us by killing two birds with one stone. It’s efficient and it’s always unexpected when done right. Share something trivial or common or innocuous that has important consequences when taken to its logical conclusion. In Agatha Christie‘s murder mystery play The Mousetrap, a couple is having an anniversary at the beginning. Taken at face value, it tells the viewer about their relationship. At the end of the play it is revealed that they were hiding anniversary presents from one another which led to an explanation of the bigger mystery. Christie was a master of this technique. The most famous form of misdirection has to be the Red Herring – a false clue mixed in with the correct ones to lead its interpreter to the wrong conclusion. Red herrings can be left accidentally or purposely by actual culprits or sympathizers. Have an expert argue against the correct interpretation. Humans tend to focus on experts in novels as in real life. When a character takes a stand against something, the burden of proof is on them as a person. Thus the focus moves away from evaluating the evidence to evaluating the expert. Make the expert believable and you will have deceived the reader. Note that you can also combine these techniques for even better results. For example, place a shotgun on the back wall in your opening scene (hidden in plain sight). Readers won’t be looking for a gun (shared out of order) until someone gets shot in chapter 4, but you can bet they’ll remember it’s there in the last chapter if you’ll only remind them where it was the whole time.